booth preserves wonderful memories for both you and your guests that are sure to last a lifetime. People love to take home souvenirs of themselves. Photo booth pictures are the most amazing wedding favor. We find that people put them on their fridge, and they often remain there for years – a lasting connection to the fond memories of a delightful day. Our all-inclusive rental package is designed to make your wedding exceptional. When you rent a wedding photo booth in BC’s Lower Mainland from Forever Captured, you receive unlimited photos – as many photo sessions as your guests want. Every photo session prints as either two traditional 2×6 inch photo strips or as one 4×6 inch postcard style print. You can choose a backdrop too – even a green screen – and we always bring a huge number of fun and interesting props to spark your guests’ creativity and bring out their fun side. One of the things we’re well known for is our beautiful photo strip designs. The way we see it, every part of a wedding needs to be themed – including the photo booth. That’s one reason why we often custom design photo strips and postcard style (4×6 inch) prints for weddings for no extra charge. We create these in consultation with the bride and groom to incorporate the overall look and feel of the wedding’s colours and theme elements. 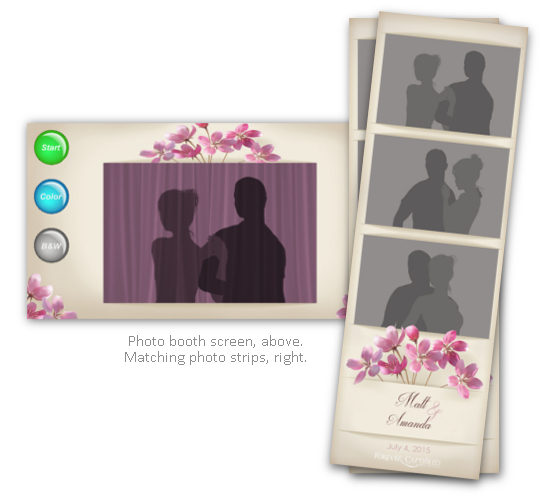 We even ensure our photo booth’s touch screen that your guests will interact with is themed to match the photo strips. The end product is a beautiful, completely customized photo strip or postcard style print that captures the magic of your special day and enables your guests to carry it home with them as the ultimate wedding favor. The experience we create doesn’t end there. We then upload all your photos to either a private or public online photo gallery where you and your guests can browse through all the photo strips, download them or share them. We even provide you with a USB stick with all your guests’ photos so you’ll have them for good. We also enhance your guests’ wedding experience by providing a friendly, professional photo booth attendant who will usher your guests through the photo booth for the entire time the booth is open, help them with the props, and make sure everyone has a great time at the booth. We further increase the fun by including – at no additional cost – a compact social sharing kiosk where your guests can email their photos to friends or share them on Facebook, Twitter, Pinterest, and other social sites. We use a modern, high tech, open concept photo booth. Each photo strip created is printed within 10 seconds. They are lab quality. They won’t smudge, and they should last a hundred years. We rent our booth for weddings across BC’s Lower Mainland and Fraser Valley. We take care of setting up the booth, operating it, and taking it down. So you don’t have to worry about a thing. All you need to do is smile for your picture and have a wonderful time. You can actually start your fun right now by clicking here to see the various photo booth layouts and wedding designs you can choose from when you rent from us. We’re also happy to custom design something for you too. We rent our photo booth by the hour and always include all the great features listed below. Rentals start at $550 for 2 hours. We then charge $150 for each additional hour. Please contact us to see if we are available for your event. There are many other extras we can work into the mix. Feel free to mention any other ideas you may be contemplating. So if you’re searching for a photo booth rental for your wedding, Forever Captured PhotoBooth is here to help you put together an exceptional experience that your guests will really enjoy and remember for years to come. Contact us today, and we can begin discussing what you have in mind for your special day. Contact us at info@forevercaptured.ca or at .